Tiffin Twilight Cornucopia using the Duncan and Miller mold. Made in the 1960's. This cornucopia is 14 inches long and about 4.5 inches wide at the mouth. In excellent condition. The color, twilight, changes color depending on the light source -- in incandescent & sunlight, it turns lavendar; under fluorescent lighting, it turns ice blue!! 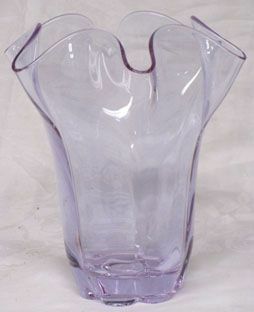 Tiffinn Twilight 8.5" Vase was made using Duncan & Miller's Canterbury molds. This vase does change color when exposed to different light sources, ei., flourescent lighting will give it an icy blue color; incandescent (or sunlight) will give it a wonderful lavender color. Duncan and Miller Covered Butter in the Tear Drop pattern. 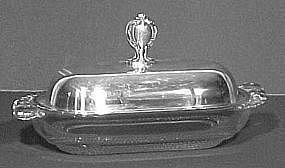 Cover is made by Rogers (silvered). Produced from the 1930's until 1955. In excellent condition. 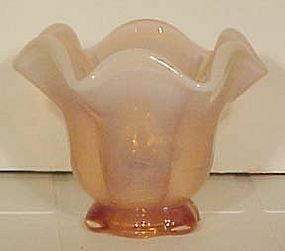 Pink Opalescent Canterbury vase by Duncan and Miller. The height is 4" x 5" wide. Manufactured from 1938 to 1955. Unusual for the footed base. In mint condition. Duncan and Miller 5-Part Relish in the Tear Drop pattern. Produced from the 1930's until 1955. In excellent condition. Duncan and Miller Sanibel 3-Part Dresser Tray in blue. Tray is 13" long and 9" wide. Produced in the 1940's and is in excellent condition. 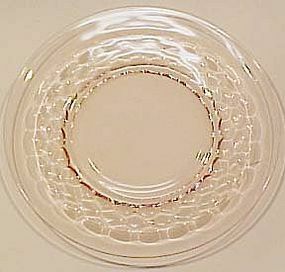 Duncan & Miller Sandwich Nappy 6"
Duncan and Miller Sandwich Nappy 6" round bowl with handle. This nappy was made between 1924 and 1955. In excellent condition. 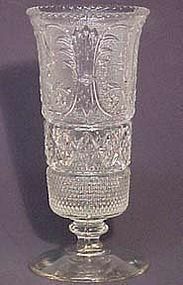 Duncan and Miller Tear Drop Cruets are being sold as a pair. 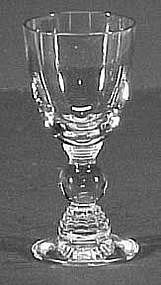 This pattern was produced starting in the 1930's and continued until the end of the company in 1955. The cruets are about 5' tall and are in excellent condition. NO issues with chips around the stoppers. Duncan and Miller Terrace Cordial. This pattern was produced starting in the 1930's. Two are available and one stands 3-5/8" and the other is 3.5" tall. Neither has been ground, just two very different heights. Both are in excellent condition. 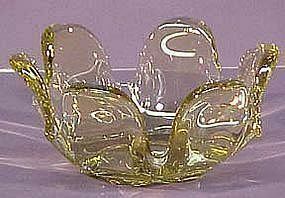 Duncan and Miller Chartreuse Canterbury 8" Bowl, about 4" deep. This color was made between 1938 and 1955. In mint condition. 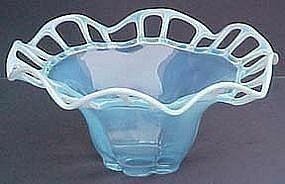 Duncan and Miller Murano 12" Bowl, Blue Opalescent, produced from 1938-55. It is in excellent condition. 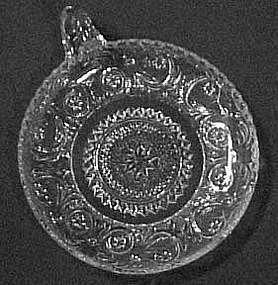 Duncan and Miller Tear Drop 3.5" ice cream dish (sherbet). This pattern was produced starting in the 1930's and continuing until the demise of the company in 1955. Eight are available, all in excellent condition. Duncan and Miller Georgian Pink 8.5" Plates were made from the late 1930's to the 1950's. All 6 in excellent condition. 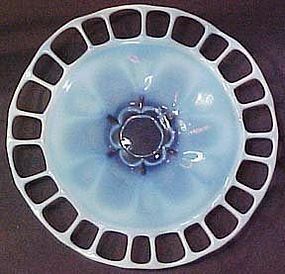 Duncan and Miller Blue Opalescent Murano Platter, 14.5" across, Blue Opalescent, produced from 1938-55. 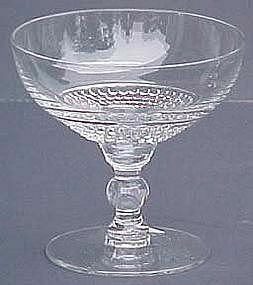 It is in mint condition -- very hard to find, probably due to the delicate nature of the reticulated rim. 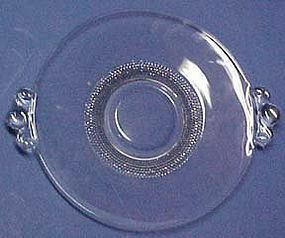 Duncan and Miller Tear Drop 2-Tab Tray is 11" wide and in excellent condition. 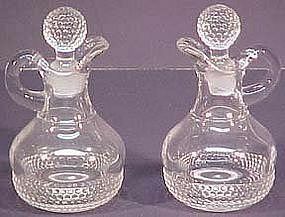 Produced by Duncan & Miller from 1924-55 in the Sandwich pattern, this pair of individual, 3.75" high shakers are in mint condition. One pair is available. 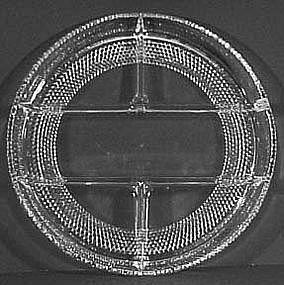 Produced by Duncan & Miller from 1924-55 in the Sandwich pattern. 10" vase is in mint condition. 2 are available. 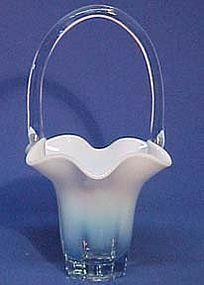 Duncan & Miller Canterbury Blue Opalescent Bakset was made from 1938-55. With the handle, the basket is 10" tall. In excellent condition.